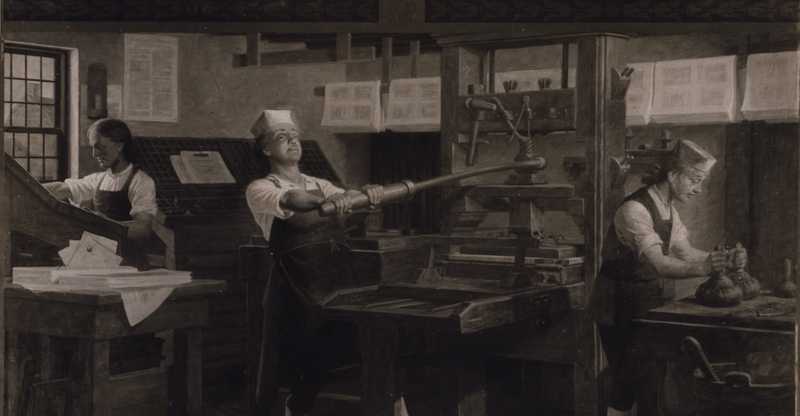 While all Americans can take pride in the accomplishments of their great Founding Father Benjamin Franklin, the mail and printing industries in particular lay claim to the fact that it was with the post and the press the great Franklin worked and made his fortune. In this feature, we re-print two classic Franklin articles — The Way To Wealth and The Whistle — to help you in your career and life. It would be thought a hard Government that should tax its People one-tenth Part of their Time, to be employed in its Service. But Idleness taxes many of us much more, if we reckon all that is spent in absolute Sloth, or doing of nothing, with that which is spent in idle Employments or Amusements, that amount to nothing. Sloth, by bringing on Diseases, absolutely shortens Life. Sloth, like Rust, consumes faster than Labor wears; while the used key is always bright, as Poor Richard says. But dost thou love Life, then do not squander Time, for that’s the stuff Life is made of, as Poor Richard says. How much more than is necessary do we spend in sleep, forgetting that The sleeping Fox catches no Poultry, and that There will be sleeping enough in the Grave, as Poor Richard says. If Time be of all Things the most precious, wasting Time must be, as Poor Richard says, the greatest Prodigality; since, as he elsewhere tells us, Lost Time is never found again; and what we call Time enough, always proves little enough: Let us then up and be doing, and doing to the Purpose; so by Diligence shall we do more with less Perplexity. Sloth makes all Things difficult, but Industry all easy, as Poor Richard says; and He that riseth late must trot all Day, and shall scarce overtake his Business at Night; while Laziness travels so slowly, that Poverty soon overtakes him, as we read in Poor Richard, who adds, Drive thy Business, let not that drive thee; and Early to Bed, and early to rise, makes a Man healthy, wealthy, and wise. Industry need not wish, and he that lives upon Hope will die fasting. He that hath a Trade hath an Estate; and he that hath a Calling, hath an Office of Profit and Honor; but then the Trade must be worked at, and the Calling well followed, or neither the Estate nor the Office will enable us to pay our Taxes. What though you have found no Treasure, nor has any rich Relation left you a Legacy, Diligence is the Mother of Good-luck, as Poor Richard says, and God gives all Things to Industry. One To-day is worth two To-morrows, and farther, Have you somewhat to do To-morrow, do it To-day. If you were a Servant, would you not be ashamed that a good Master should catch you idle? Are you then your own Master, be ashamed to catch yourself idle. Stick to it steadily; and you will see great Effects, for Constant Dropping wears away Stones, and by Diligence and Patience the Mouse ate in two the Cable; and Little Strokes fell great Oaks. Methinks I hear some of you say, Must a Man afford himself no Leisure? I will tell thee, my friend, what Poor Richard says, Employ thy Time well, if thou meanest to gain Leisure; and, since thou art not sure of a Minute, throw not away an Hour. Leisure, is Time for doing something useful; this Leisure the diligent Man will obtain, but the lazy Man never; so that, as Poor Richard says, A Life of Leisure and a Life of Laziness are two things. Keep thy Shop, and thy Shop will keep thee; and again, If you would have your business done, go; if not, send. A little Neglect may breed great Mischief: adding, for want of a Nail the Shoe was lost; for want of a Shoe the Horse was lost; and for want of a Horse the Rider was lost, being overtaken and slain by the Enemy; all for the want of Care about a Horse-shoe Nail. So much for Industry, my Friends, and Attention to one’s own Business; but to these we must add Frugality. What maintains one Vice, would bring up two Children. You may think perhaps, that a little Tea, or a little Punch now and then, Diet a little more costly, Clothes a little finer, and a little Entertainment now and then, can be no great Matter; but remember what Poor Richard says, Many a Little makes a Mickle. Beware of little expenses; A small Leak will sink a great Ship; and again, Who Dainties love, shall Beggars prove; and moreover, Fools make Feasts, and wise Men eat them. Buy what thou hast no Need of, and ere long thou shalt sell thy Necessaries. If you would know the Value of Money, go and try to borrow some; for, he that goes a borrowing goes a sorrowing. The second Vice is Lying, the first is running in Debt. Poverty often deprives a Man of all Spirit and Virtue: ‘Tis hard for an empty Bag to stand upright. And now to conclude, Experience keeps a dear School, but Fools will learn in no other, and scarce in that; for it is true, we may give Advice, but we cannot give Conduct, as Poor Richard says: However, remember this, They that won’t be counseled, can’t be helped, as Poor Richard says: and farther, That if you will not hear Reason, she’ll surely rap your Knuckles. I am charmed with your description of Paradise, and with your plan of living there; and I approve much of your conclusion, that, in the meantime, we should draw all the good we can from this world. In my opinion, we might all draw more good from it than we do, and suffer less evil, if we would take care not to give too much for whistles. For to me it seems, that most of the unhappy people we meet with, are become so by neglect of that caution. When I was a child of seven year old, my friends, on a holiday, filled my pocket with coppers. I went directly to a shop where they sold toys for children; and being charmed with the sound of a whistle, that I met by the way in the hands of another boy, I voluntarily offered and gave all my money for one. When I saw another fond of popularity, constantly employing himself in political bustles, neglecting his own affairs, and ruining them by neglect, He pays, indeed, said I, too much for his whistle. If I knew a miser who gave up every kind of comfortable living, all the pleasure of doing good to others, all the esteem of his fellow citizens, and the joys of benevolent friendship, for the sake of accumulating wealth, Poor man, said I, you pay too much for your whistle. When I see a beautiful, sweet-tempered girl married to an ill-natured brute of a husband, What a pity, say I, that she should pay so much for a whistle! Yet I ought to have charity for these unhappy people, when I consider, that, with all this wisdom of which I am boasting, there are certain things in the world so tempting, for example, the apples of King John, which happily are not to be bought; for if they were put to sale by auction, I might very easily be led to ruin myself in the purchase, and find that I had once more given too much for the whistle.